This has been in the planning stage for over 6 months but finally work has begun! 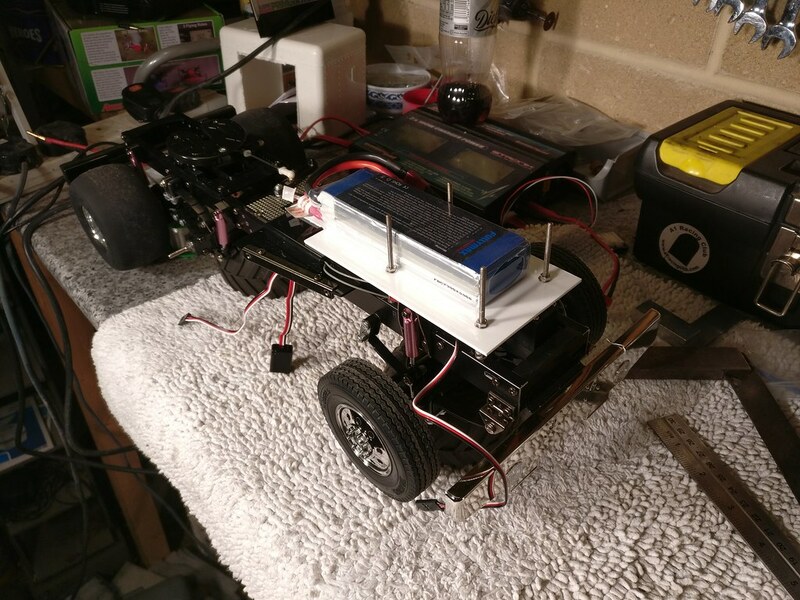 To complement my Custom MFC build using an Arduino, this rig will be a dual purpose drag racing truck and daycab hauler. It's going to be built for scale realism rather than speed - it'll have 3S 550 power through a reduction gearbox to give a very low top speed (around the same top speed as 1st gear from a Tamiya transmission) as it will only get use on small club layouts. In daycab hauler trim, it's a plain old 10-wheeler with a 5th wheel. 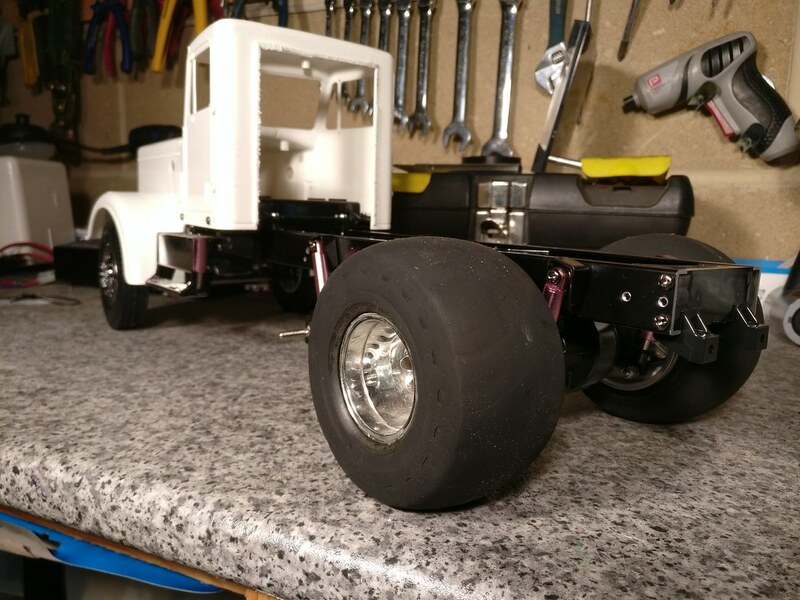 In drag truck trim, the centre axle will be lifted up into the chassis using straps and I'll be using TLT wheels and cut tyres as drag slicks on the rear axle. Front wheels will remain unchanged. To hide the middle axle and to make it look more drag-racey, I'll build an aero cowl to clip over the entire back end and probably a front spoiler to clip onto the bumper. So there's quite a lot of custom work to do here. 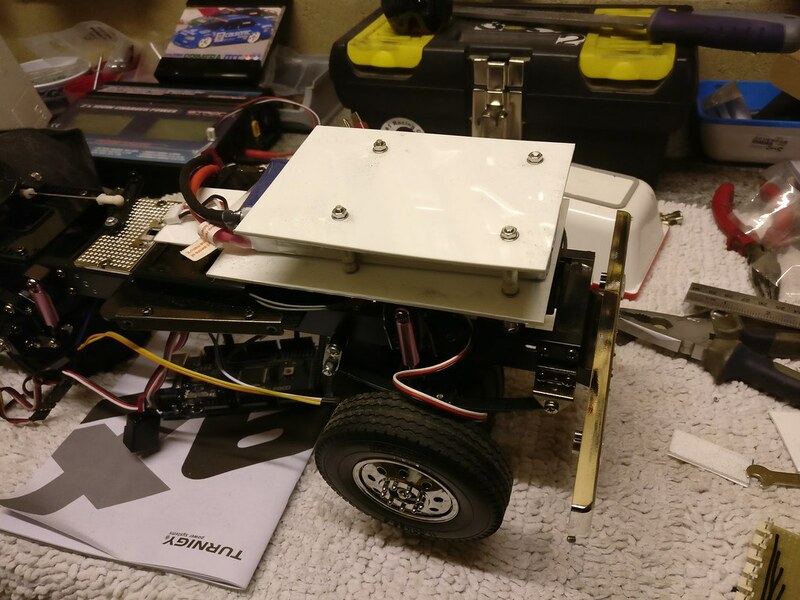 On top of that I also need to mount my reduction gearbox and 550 motor, somehow. 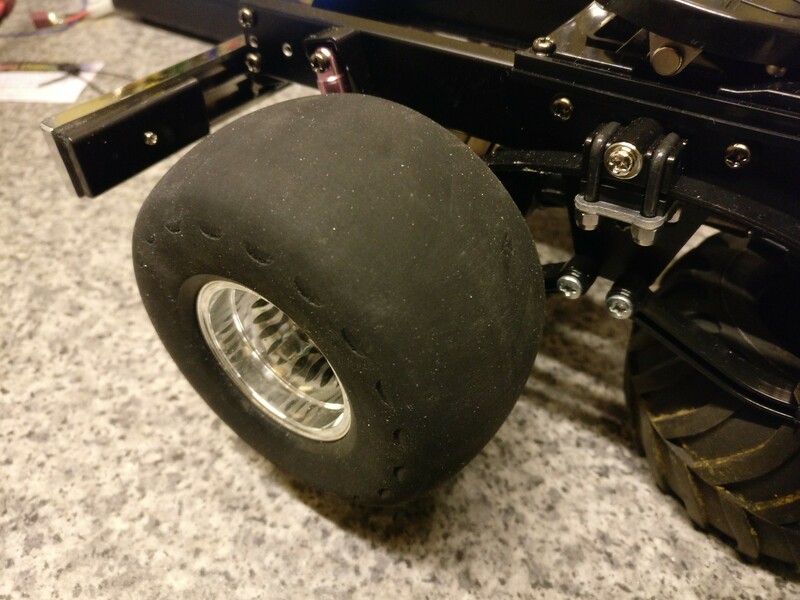 Didn't get a lot of workshop time this weekend but I managed to snag a couple of hours during baby naptime to make some drag slicks. OK, they're not perfect, but they should look good once decorated with some Hoosier stencils and buried under some aero bodywork. Anyway, these drag slicks started life as TLT-1 tyres. For some reason I've got an abundance of TLT wheels and tyres, so I didn't mind ruining a couple, especially as I don't actually have a TLT-1. Actually this particular pair came to me on something else - I forget what, exactly, possibly a half-finished sand rail buggy or a TB-02 chassis that was modified as an RWD Schlesser Buggy replica - and half the chevrons had already been painstakingly removed by the previous owner. That meant I only had 20 chevrons to clip off with side cutters or slice off with a hobby knife, both fraught with their own risks and both ending up in injuries of their own design. Well, it's not a proper afternoon in the workshop if you don't nearly slice the top of your finger off. Having chopping the bulk of the rubber off, I needed to smooth off the tyre surface. 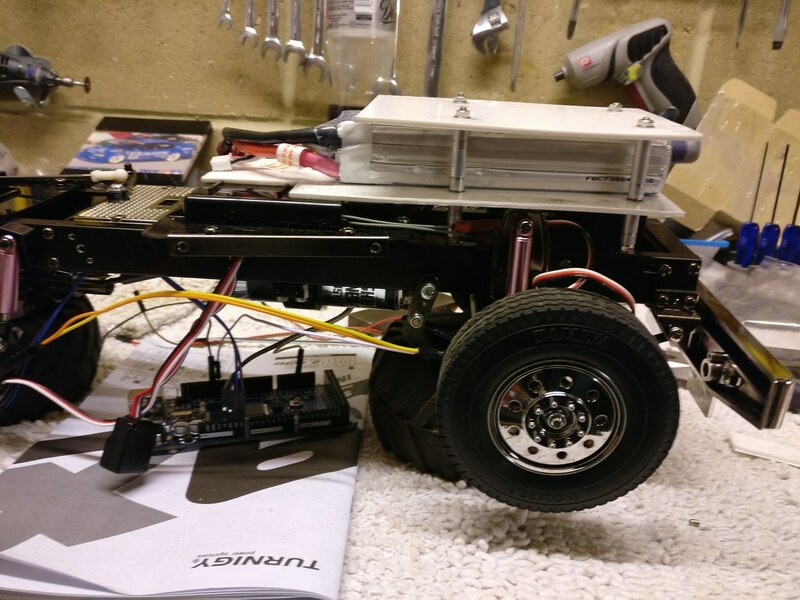 My original plan had been to put the tyre on a spare axle shaft and put it in the electric drill, but the chuck was too big to fit in the TLT wheels. I tried the Dremel, thinking it wouldn't have enough torque - it turns out it has plenty of torque, it just doesn't have a low enough RPM. Even on its slowest speed the tyre bulged enough to come off the rim. Attached the tyres to the rig at lunch to see how they look. I was a bit worried by how close to the chassis the tyres are. They don't rub, but visually they look a bit odd. However, by happy accident, the inner bead didn't seat properly in the wheel rim and the result was more inner clearance and a fatter looking bulge on the outer wall. Result. I'll trim off the outer rim and seat the tyre against the inner portion of the inner rim - there's enough meat on the wheel and a bit of glue will secure it in place nicely. I had a bit more time in the workshop last night, so I decided to cut the inner rim off a new pair of TLT wheels and get them fitted properly. No WR-02 this time - cutting rims needs a slower approach. 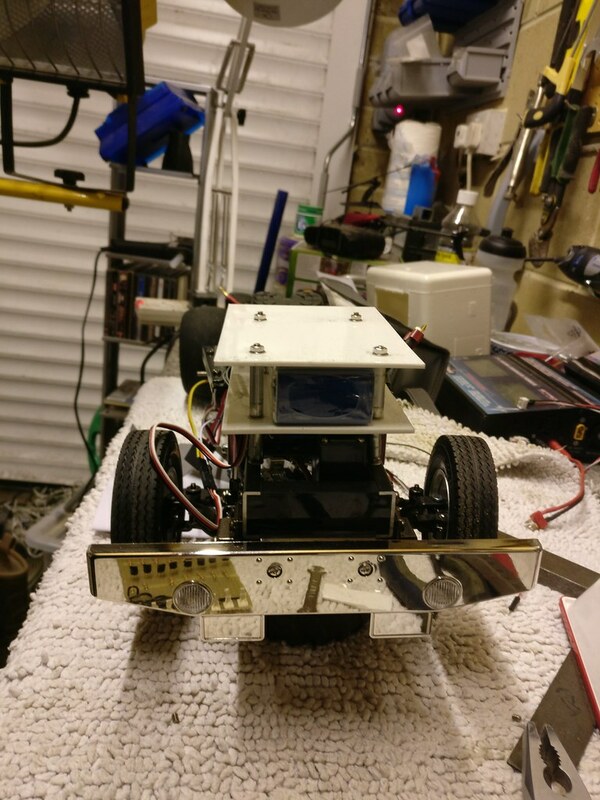 I used my CC01 Hopup rig, which has also had a lot of use as a test rig for the Arduino MFU recently. 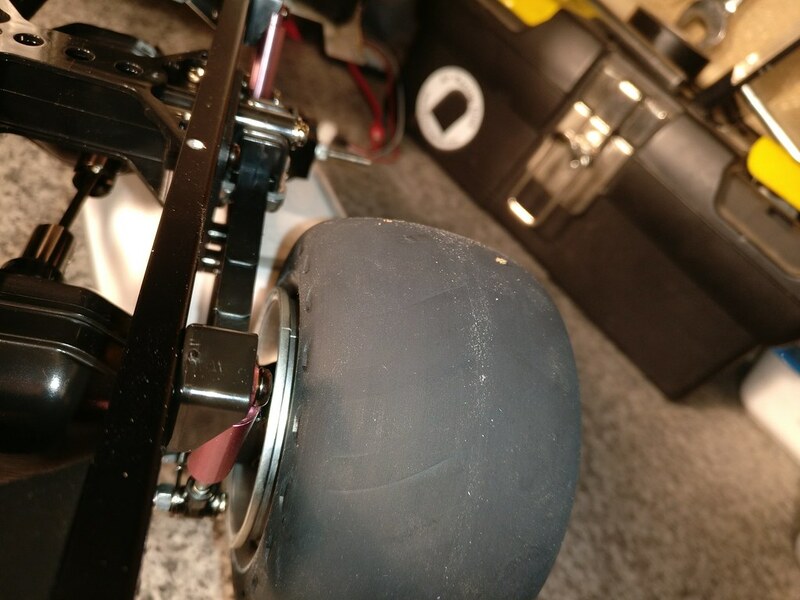 Here's some side-by-side comparison shots of the tyre profile on the narrowed and stock wheels. Stock wheel is on the left, narrowed wheel on the right. I'm pleased with the results. The tyre wall looks a lot more chunky, like a proper drag tyre, on the narrower rim, but surprisingly the curve of the rim isn't exacerbated at all, so it doesn't look too much like a motorcycle tyre. I guess all the curve has been taken up in the shoulder. I haven't glued the tyres yet (since I usually make a total mess of it) but they will need gluing before use, I struggled just to tighten up the wheel nuts! With no inner rim on the wheel's back face there's nothing to stop the back of the tyre from dislocating, which it will probably do under load. It sits just fine on the workbench though. 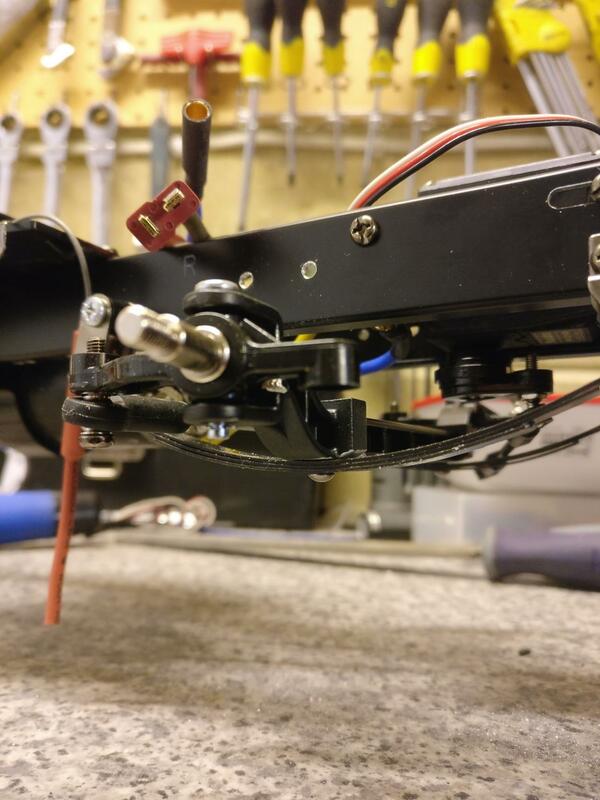 I also made some progress on my Arduino code last night (follow-up post in that thread later - duty beckons) so I was able to centralise my Futaba steering servo and get it fitted. The rig is taking shape. 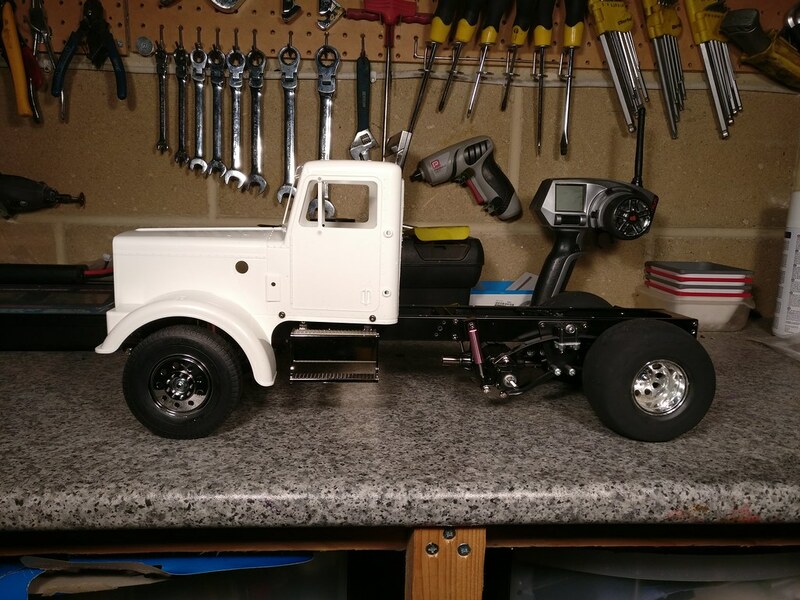 Next truck meet is 23rd Feb and it would be great to have an unpainted but functional rig to demo, at least to get some live running on the Arduino MFU. now is it for the Drag Pulls? with the inclined trailer and weights? i've been wondering what to build next after my Three Irons in the Fire are finished. you helped me figure on the next build i had not given any thought to do. there was a fellow on OSE some time ago and had something similar, it was rough lookn' but his suspension was unreal. 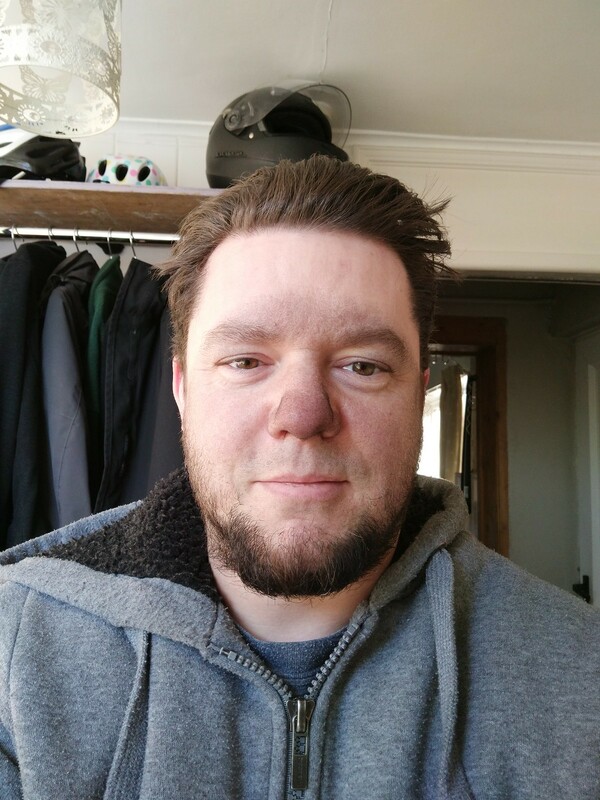 At the moment I'm going for a quarter-mile tarmac drag race look. There's not really a lot of inspiration pics out there since quarter miling isn't really a bit thing for a big rig. There's lot of videos online of people drag racing their street legal haulers with regular trailers on the back but not much for solo rigs. The best example is the Bandag Bullet, which has become more about burnouts and donuts than straight line racing. That said, there is someone who goes to the Bristol meet who has an inclined trailer. I'm pretty sure it has a mobile weight that rides forward during the run. I'm not sure if it's fully functional - I'll ask him about it next time I see him. There's no reason why I couldn't make up a 3rd set of aero bodywork that retains access to the fifth wheel and allows fitment of regular paddled TLT wheels for proper mud-sledding duties. you figure some Marine Offshore racing boats use diesels that some how Big Rigs would follow suit with X-over mechanical and tech to really launch these things. i've seen similar videos of what you mentioned. once one kit is finished i always either go off onto my slots or trains (the house always needs something done and doing so for a living) i'd rather build and work on my hobbies, it's actually more of a challenge. iam rather running out of room to display everything that i've done through out the years. but they're like my kids they are all just so different and want to build more (but no more kids). i'll be following your endeavor here, this is quite fun. i've built four 1/24th Slot dragster cars, but this WHOA! now lets do this in 1:14 are you ready? @ACCEL I like that a lot! Even for some basic detailing around the front end. I considered a roof chop on my rig (and I'm still considering it) but I'm not sure if it would look odd when the truck is in road-hauler trim. OK - quick update, since it's been a while since I added any photos. 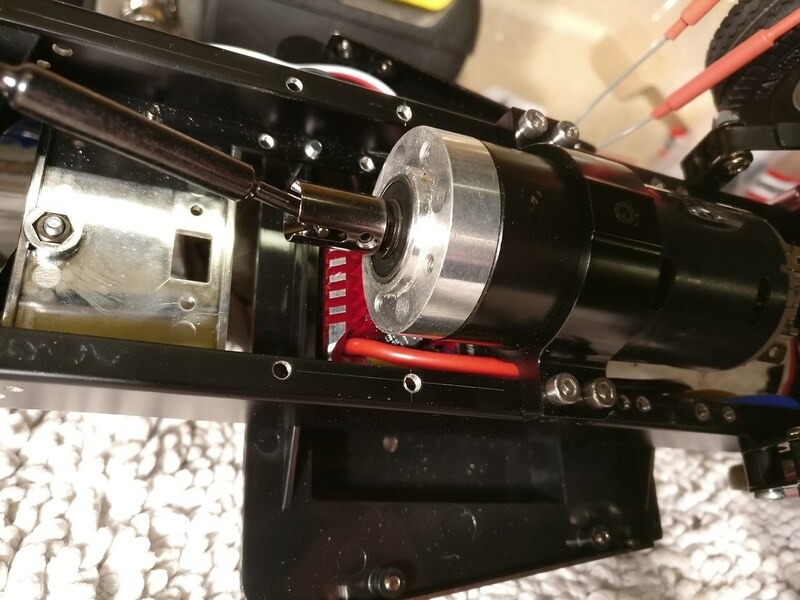 As I mentioned earlier (or elsewhere, I forget) I bought a cheap 550 motor attached to a planetary gearbox, but I don't have access to a milling machine and making a bracket out of plate metal or Delrin was likely to be awkward, ugly, flimsy and/or brittle. 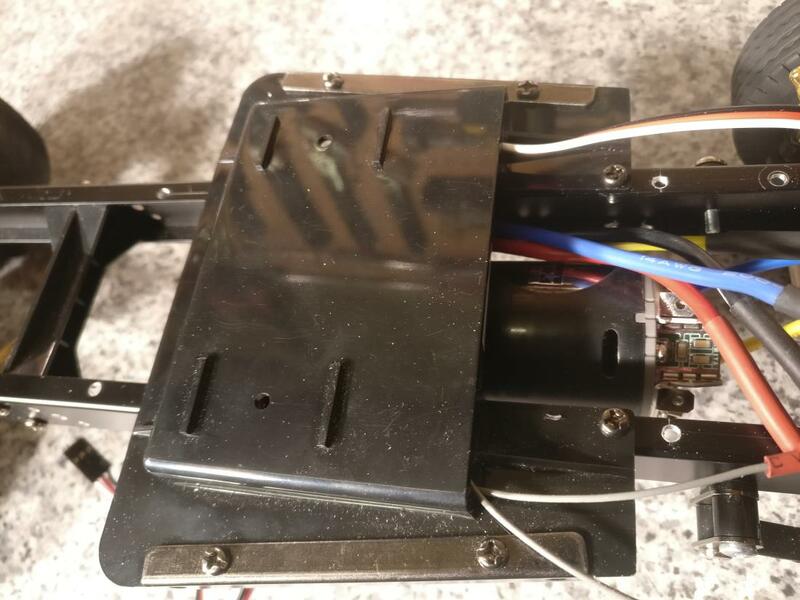 Fortunately a friend got in touch to say he was selling a little-used Lesu reduction gearbox attached to a genuine Tamiya truck puller motor. 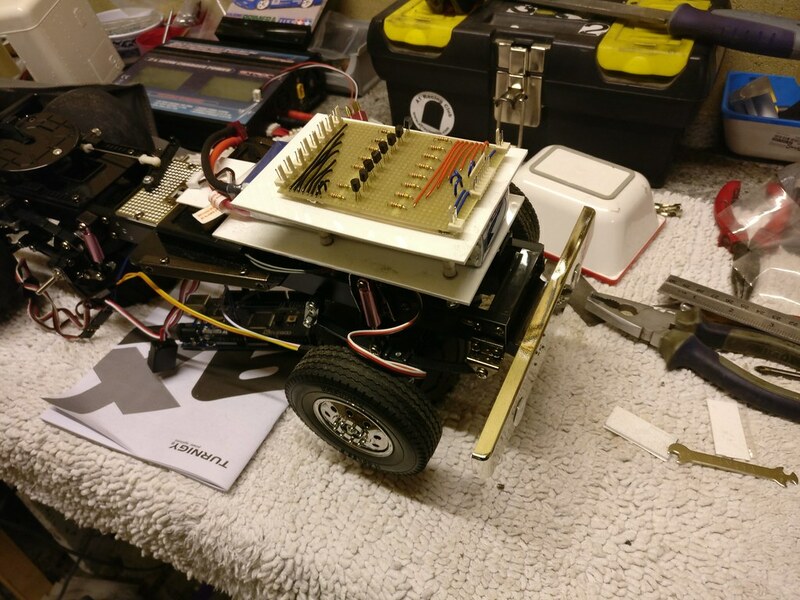 The chassis needed some drilling to fit it (actually I drilled it twice as I wasn't happy with the first location) but otherwise it went on without a hitch. In the end I installed it so that the drive cup is in the exact same location as it would be on a Globe Liner. For some reason this means I don't get full upward suspension articulation on the middle axle (seems to be the same problem on the Globe Liner) and if I try to achieve full articulation on the rear axle the propshaft pops out. Never noticed that on the Globe before but then I only run on smooth surfaces. It's noticeable on the Drag King because I'm currently running with no middle wheels and nothing to tie the middle axle up. The complete solution will either be to fit a propshaft with a slider or to get rid of the middle axle (which I've long been thinking about anyway). I'm not sure what changes I'd need to make to remove the middle axle. I'd have to go through the instruction manual for a single rear axle rig and see what additional parts I'd need. I also started fitting up the electrics. I'm trying to cram a lot of stuff into a very small space (remind me again why I went with a day cab..?) and I'm struggling. Using the stock holes in the chassis rail, I mounted some threaded rod to make some storage shelves. Aluminium tube from B&Q to space the shelves. Shelf made out of 2mm plasticard. 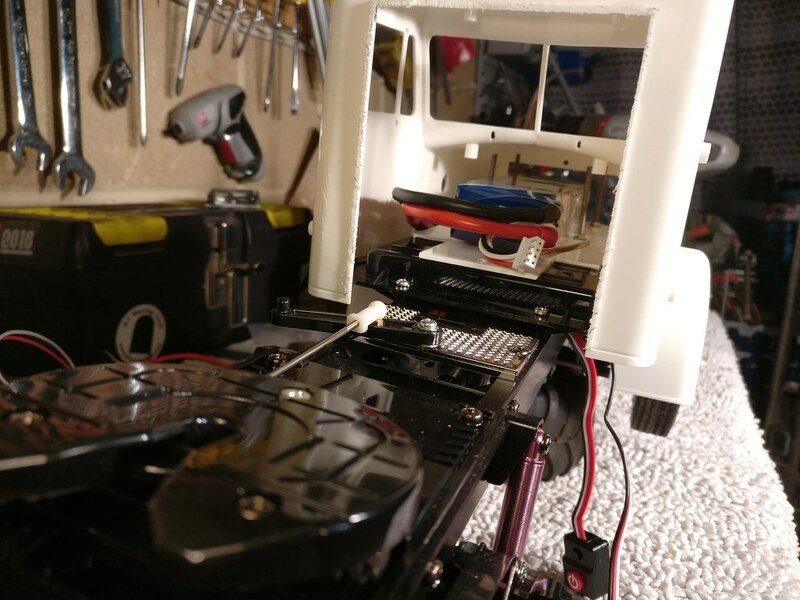 LiPo neatly fits between the seat mounts. Might need some modifications to the interior but this seemed the best way to install the battery. As you can see - the battery takes up most of the space and leaves nothing over. This is a bit of a bummer, TBH, and I think I'm going to struggle with these batteries. I should have seen sense and bought smaller packs to start with but I was drawn in by the large capacity and the hope of running my other cars on the same packs. I don't regret buying these packs - they'll get some use - but I'll have to wait until next month to buy some smaller packs for the rig. Anyway, I went ahead and cut another shelf to sit on top of the battery, for now. As and when I get a smaller battery I can drop this shelf a little to make space above it for the LED board. Here's the LED board. Transistors take the low-current logic voltage from the Arduino pins to switch the higher voltage from the BEC. The resistors under the red (positive) wires protect the Arduino pins from over-current through the transistor base, and resistors after the transistor emitters protect the LEDs from over-current. Annoyingly this is just a few mm too tall to fit here and clear the hood. 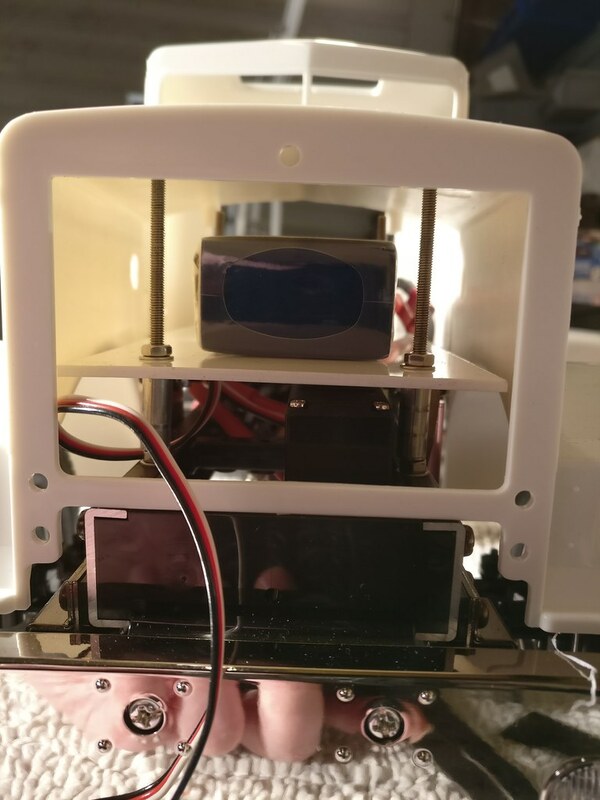 I will need to source some laydown (90 degree) connectors to reduce the clearance, and/or drop the shelf once a smaller battery arrives. Ultimately this board will be taped to the underside of the hood, as it will have a single multi-plug to connect it to the rest of the truck, making it easy to plug on and off. The LED strings will each have their own plug but mostly they are mounted onto the body anyway so won't need to be plugged and unplugged when removing the body. I'll probably install a multiplug at the back of the cab for tail light duties and (eventually) IR-LED trailer lights. I keep asking myself the same thing. 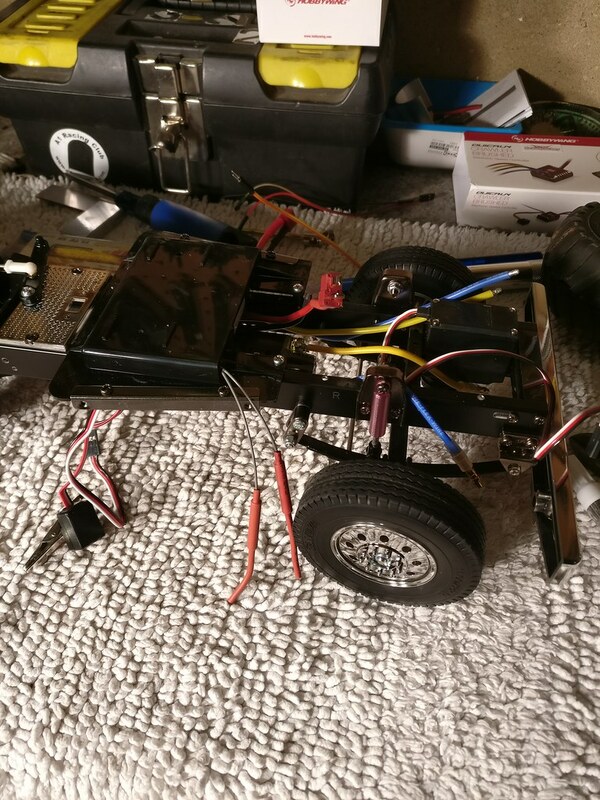 I mentioned elsewhere that I'm having some bad glitching on the steering servo with the Turnigy 9X radio. 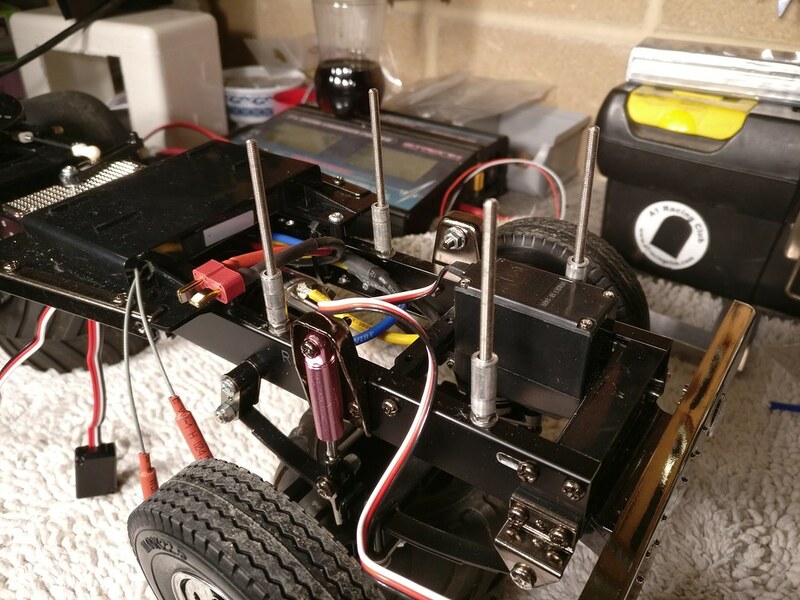 I've tried different channels and different servos but it's always the same. I haven't tried another receiver since my other Turnigy receivers don't seem to bind, I guess they have a different (FlySky) protocol. The 9X is quite an old model now. 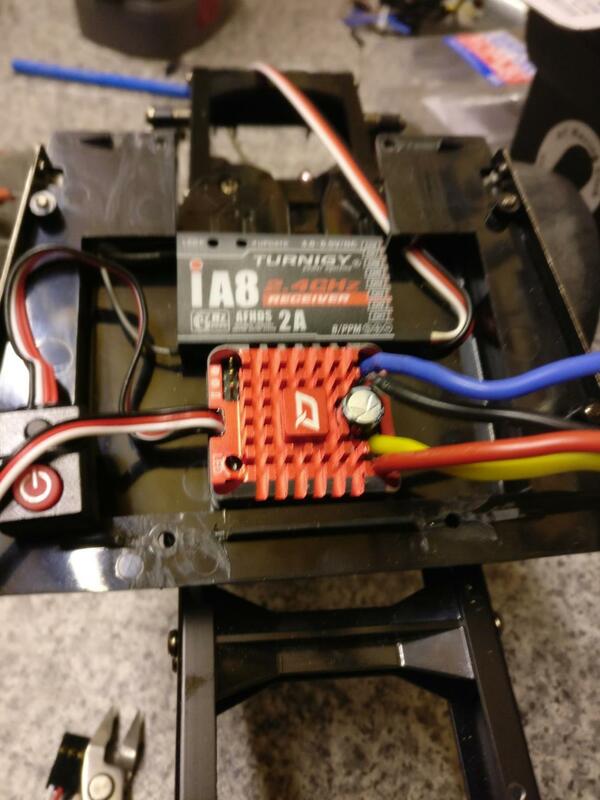 I did a lot of searching online, some people say it's a Turnigy issue and not to use the 9X at all, some people say it could be a whole host of different problems with Tx or Rx, some people say to throw out the Turnigy module and fit a FrSky or other module. However one source said it could be an interference problem caused by the servo leads picking up nearby frequencies. Well - it happens when I have just the Tx, Rx, ESC and servo connected (with no Arduino or other boards) but it's definitely worse with the Arduino hooked up with long jumper leads. So it could be interference. It's also worth noting that I only ever get time to work on the truck when my daughter is sleeping and there's a baby video monitor switched on nearby, which are notorious for interfering with **** near everything (my WiFi drops out all the time when the monitor is on). So when I install the electrics for the final time I'll custom-make the leads as short as I can get away with (it'll be like a wire tuck on a stanced car! ), hide them behind the chassis rails for best shielding, and maybe add some other shielding to them. Another job I need to do is get hold of the Arduino that I'll be installing. I've been testing with an Elegoo Mega2560 but it's quite big. I might be able to use it in the final project if I can fit it on the shelf where the battery currently sits, but I'll probably need that space for an amplifier board. I can't install a less powerful Arduino as I need a lot of PWM outputs for the LEDs and servos some additional interrupts for the PPM input. However, hunting around on eBay I found some very tiny Mega2560 boards that seem to be full-featured but with a very small footprint, and they're only £6.99 each. 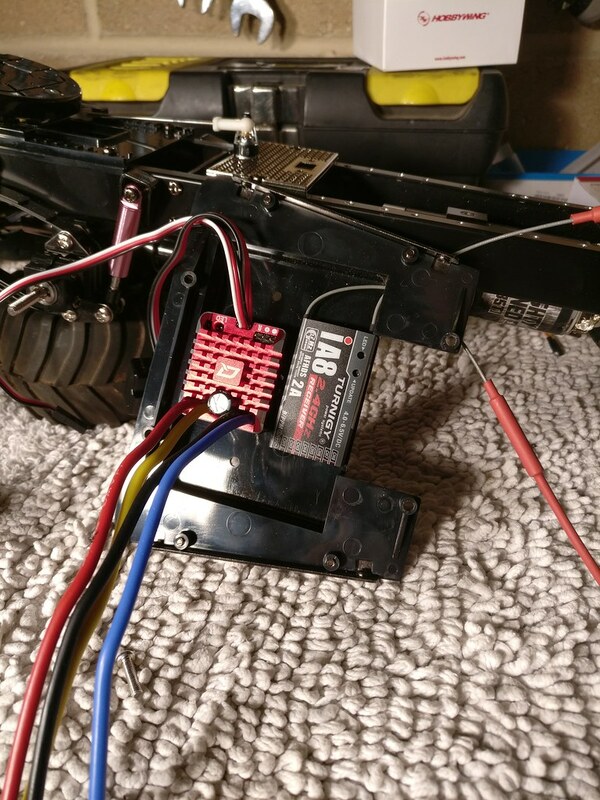 A couple of those would probably fit underneath the battery shelf, just along from where the ESC and Rx are, leaving space for the amplifier on the battery shelf. 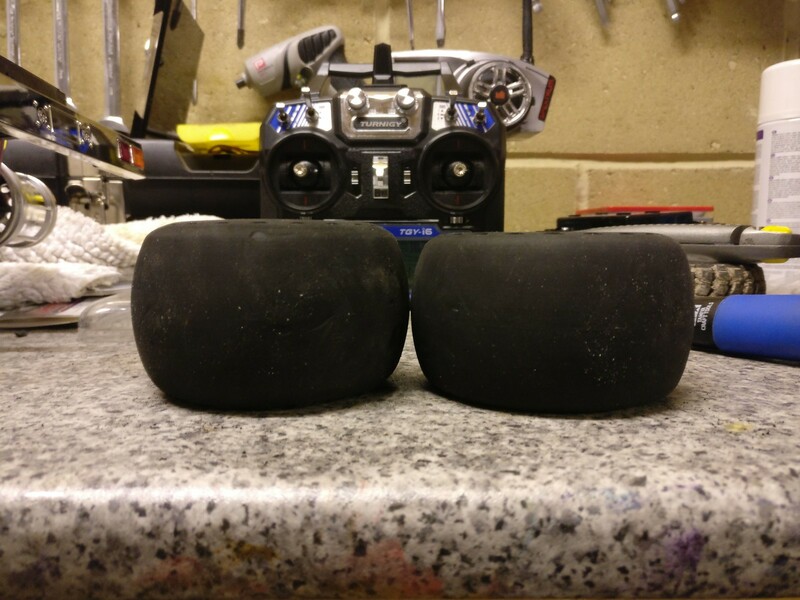 I've measured up for a smaller battery from HobbyKing and I'll have to do away with the stock seat mounts. I'll create a shelf for the seats to go on with the battery sliding in underneath. I'd like there to be foot space for a driver figure and at the moment it looks like it'll fit. 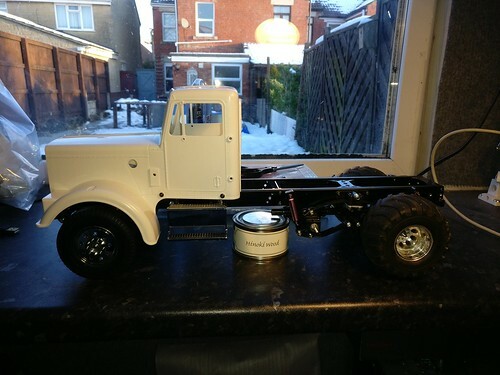 I ran the truck in a very trimmed-down and unpainted look at the last Bournemouth RC truck meet in February. One of the organisers is a big hotrod fan and has a number of Grand Hauler-based hotrods, and he had a lot to say about the Drag King - most notably that it was too tall and needed to be lowered! So my first plan was to drop the body. 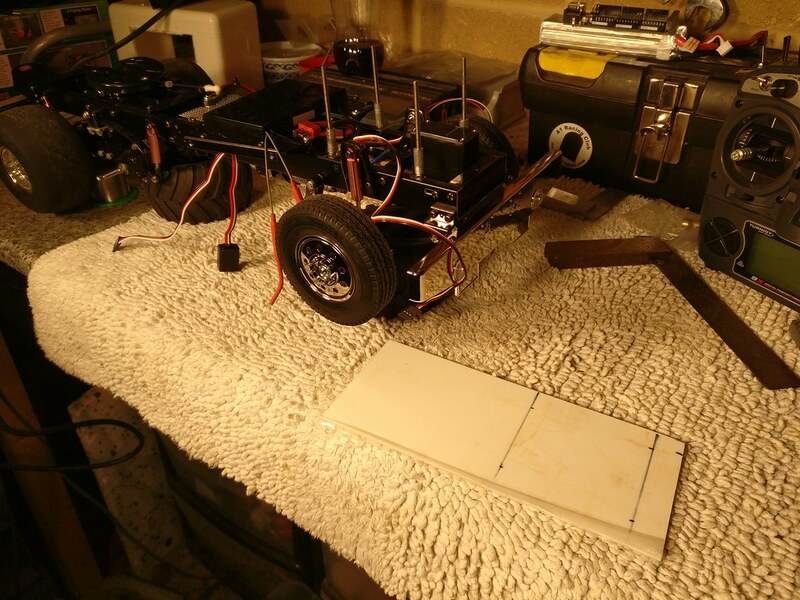 The King Hauler body mount plate makes it quite easy - just cut out the spacers beneath the plate so the plate sits directly on the chassis rails and you've got an instant body drop. And it all fits very neatly onto the chassis. 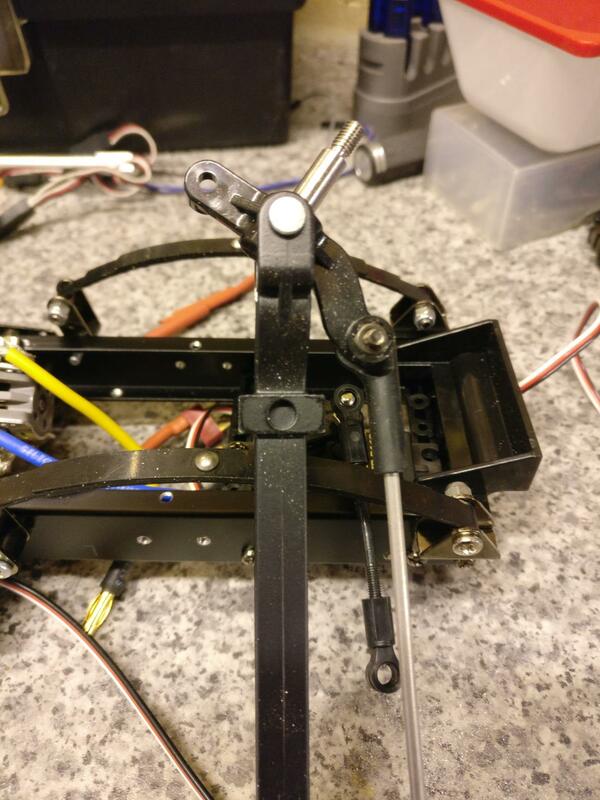 OK, I had to file away part of the Lesu transmission mount because it was catching on the ESC, and I'm not sure if you'd have clearance issues on a stock rig over the standard gearbox. 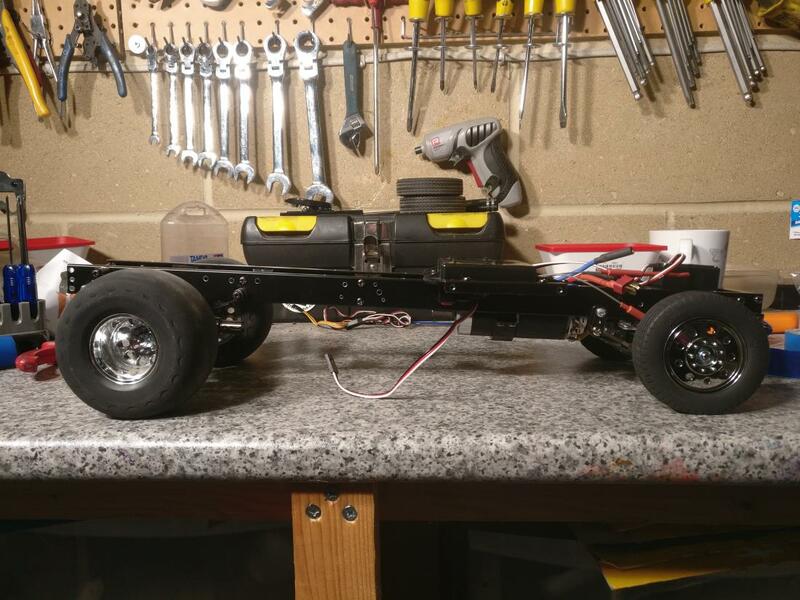 My next plan was to do away with the twin rear axles and go for a basic 4x2 setup. I managed to get a Scania R470 for not much money, which was a cheaper way of getting the single rear axle suspension than buying the parts bags and plastic trees separately, plus it means I have enough spare parts (besides chassis rails) to build a Scania 8x4 when I have the time. 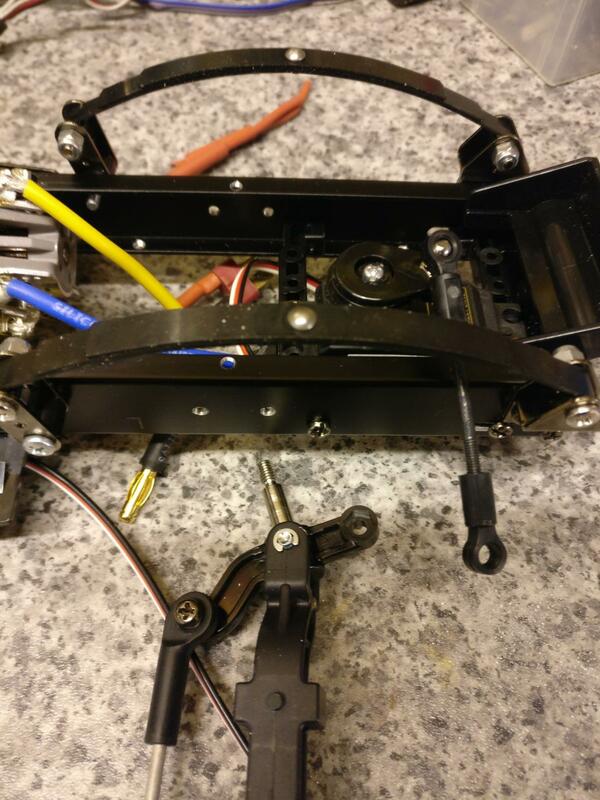 I had to re-drill the chassis rails to fit the rear suspension. I took the chassis rails from the R470 and used them as a template. The Drag King is running Globe Liner chassis rails, so they're a little shorter than stock anyway, and I redrilled the axle to pull it forward just a little more, while keeping the same distance between the axle centre and the fifth wheel centre as on the R470, using the stock Globe Liner fifth wheel mounting position. End result is a wheelbase that's a little shorter than a stock Globe Liner. It still looks very long on the bench, but I think that's because it doesn't have any tanks or bodywork mounted along the rails. That'll change as I fabricate the back end. Obviously the chassis now has a longer tail than a stock Globe Liner. I'll have to run it with a trailer to see if that affects it at all. The tail is actually no longer than the tail on the R470, but the Euro trucks have a sloped tail, possibly to aid clearance under trailers. If I have tail trouble then I can always shop the chassis ends off. So, what's left to do? Apart from, like, everything? Well, it won't run now until I get a new propshaft. There's a fair distance from transmission output to axle, I'm not sure if it'll need a centre bearing. I will try to fabricate a dogbone-style propshaft when I have time just to test if it will be feasible to run that way, or if I should get a custom sliding shaft made (actually I might have a stock TXT shaft that will fit...) or if I should buy a centre bearing. It's also worth nothing that the stock cab steps won't fit with the lowered cab. 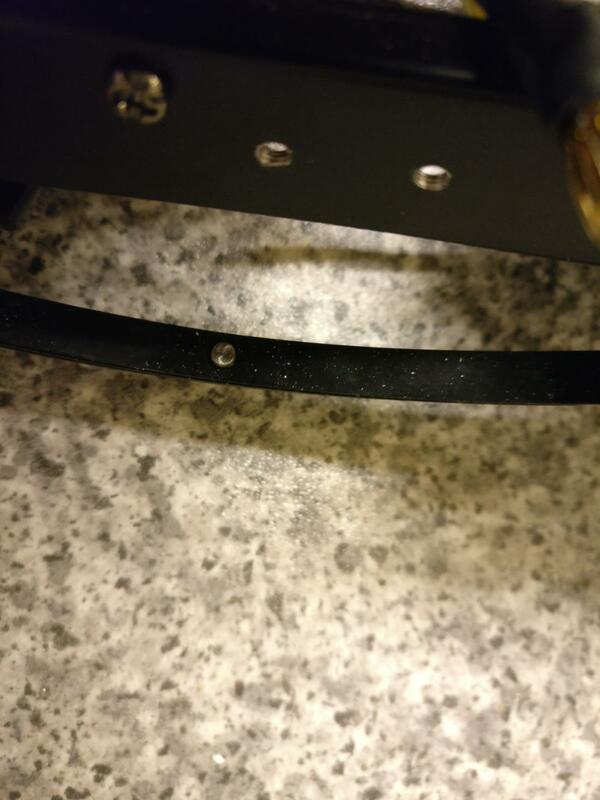 The body mount plate is spaced up so it clears the step brackets. But as this is a custom drag truck, I wasn't planning on running the stock steps anyway. However this is persuading me to move away from this being a dual purpose Drag Truck / Everyday Hauler and more into a Drag Truck / Lowrider Show Hauler, so there may be less removable body panels than I'd originally intended. 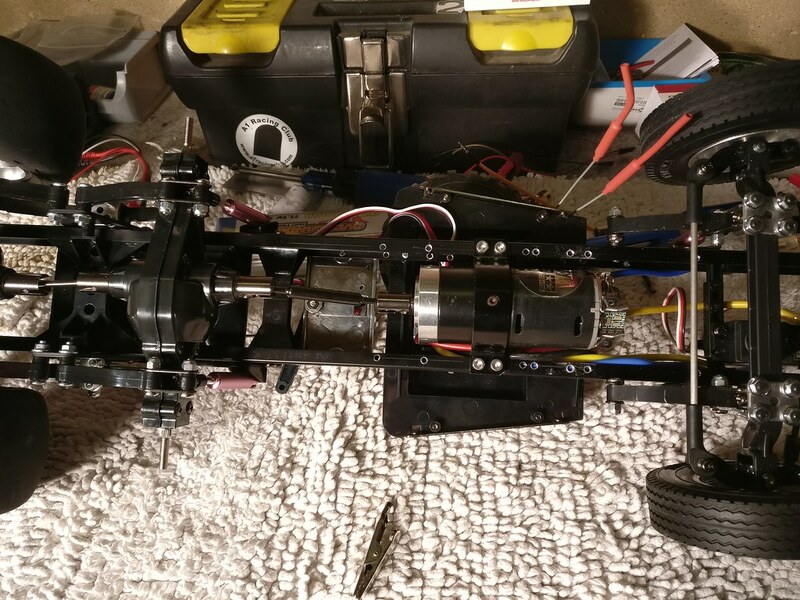 So - next mission is to look at a propshaft, then look at whether it's going to be possible to drop the suspension by a few more mm, then probably start fabricating bodywork. I'm also considering chopping the stock arches - at the moment there's still clearance for the wheels to turn but if I go any lower it won't be driveable. I won't remove the arches entirely - I'll just cut the outer lip so the wheels can turn. So, I had another look at lowering the rig this weekend. It looks like there are various options depending on how aggressive I want to go. the front axle has about 1-2mm of metal on top of the spring mount. This could be filed away quite easily. I think there's a divot in the stock position to accommodate the rivet head in the springs, but that should be easy to re-drill. Actually might be easier to drill is before filing by making the stock divot deeper. The rear end can be brought into line by removing one of the leaf mounts (part C10). This should give a drop of around 2mm. This should be subtle, and against a stock rig should be noticeable (especially with the body drop) but there are currently so many seriously slammed King-based rat-rods on the custom scene that it might not be noticeable against other customs. Smaller tyres. 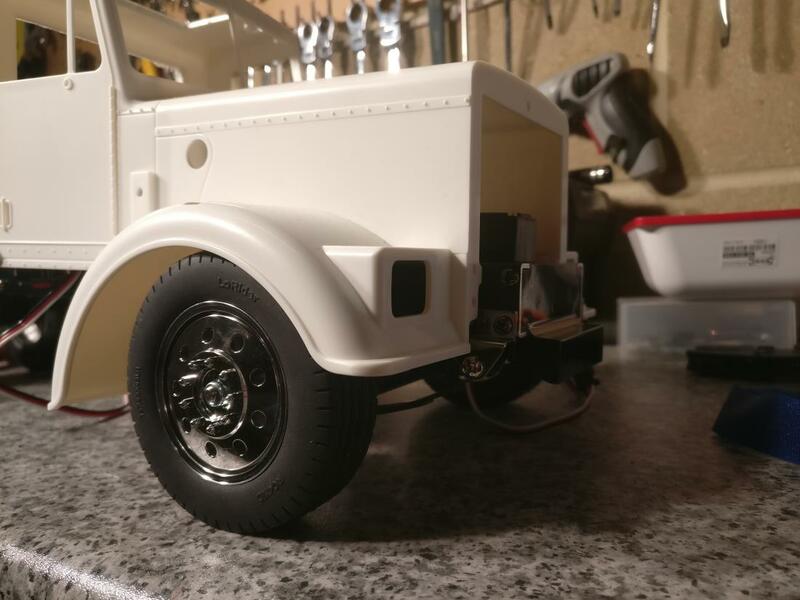 Looking at some online photos, there's lots of custom 1:1 Kenworths called 'lowriders' because they've got smaller tyres. Sometimes smaller mudguards are fitted so the wheels don't look lost. Smaller tyres are available and would give an immediate reduction in height without any other supporting work. The main bonus with this option is that all I have to do is swap out the wheels and I'm back to stock ride height for hauling. 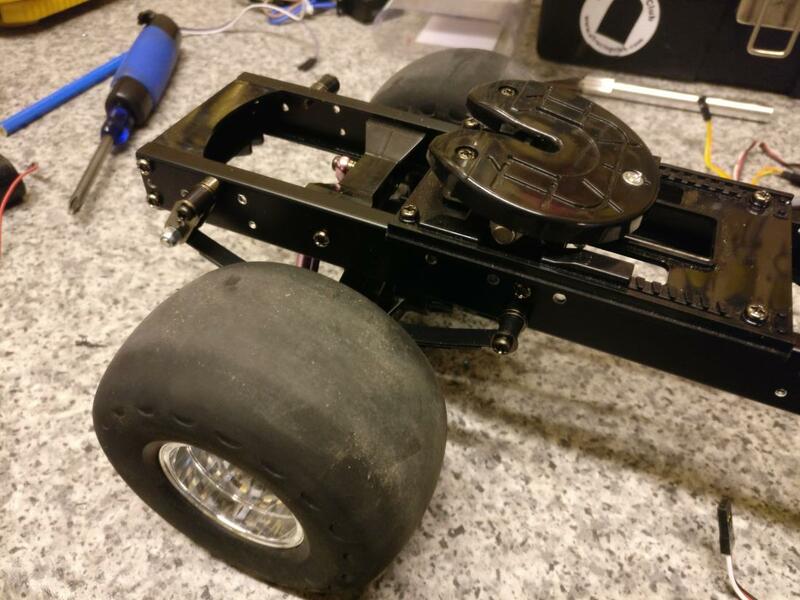 However I would be back to the drawing board for the back end, because I need a wide set of drag slicks for when the rig is in drag mode, and I don't know what is likely to fit and look right. 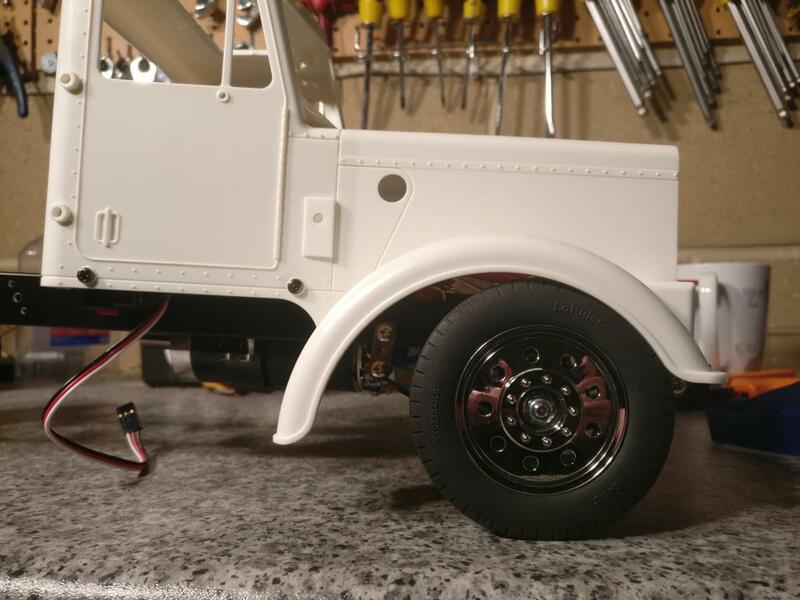 The stock TLT wheels and tyres are a good match for stock Tamiya truck tyres. With the ribs sanded off they're only marginally taller. Now, if I could find a set of super-fat rubber tyres that would squeeze over a double set of truck rears and make them look like a fat single, that would be awesome. But I previously looked and didn't find anything. I think the rig would look silly if I put low profiles up front and kept the big TLTs out back. The few images I have of drag trucks show them with low profiles up front and a flat chassis, not a chassis with a heavy forward lean. Spring-under-axle mounts. Looking at the front end, this should be easy. It'll give a huge drop without many major mods. I might have to profile the bottom of the leaf mounts to get the leafs to sit comfortably against the axle. A divot will probably have to be drilled. I might have to get creative with the steering linkage but otherwise I foresee no technical problems, especially as I've already removed the front shocks to gain under-hood space for electrics. If you wanted to do this and keep the front shocks you could always make longer shock hoops or use shorter shocks. The scale scene is full of interesting shock and hoop options. Obviously suspension travel will be limited but as far as I can tell there will still be at least some movement. The big problem here is the body. 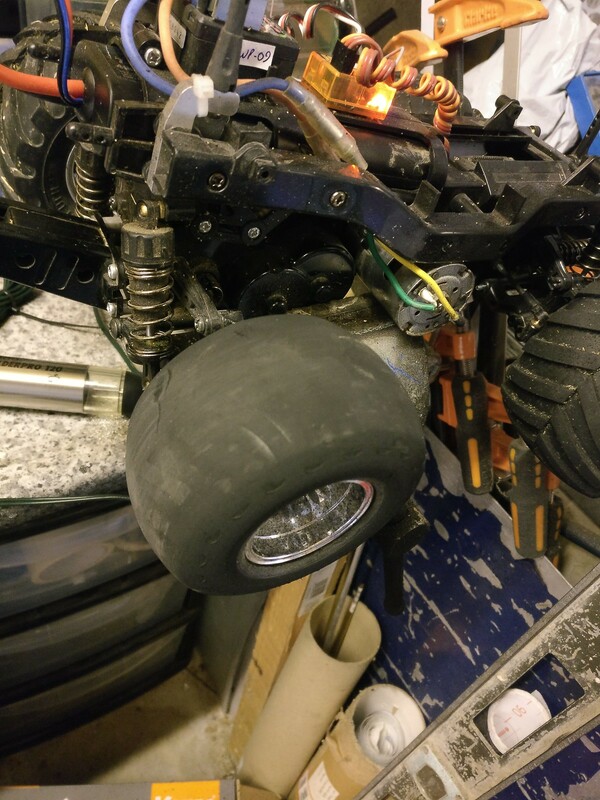 The drop is so aggressive (around 10mm) that the wheels will be well up into the arches - worse on my rig as my body is already lower than stock. I don't think the wheels will actually fit facing forwards, let alone steering. If I was to go this route I would probably cut the arches off the body using the tried-and-tested cotton thread trick, and glue them back on higher up. That would probably give a very fat look. Actually if I hadn't spent yesterday on family stuff I probably would have gone ahead and done this already; as it is I'm glad I didn't as I'm still not sure it's the look I want. The finished truck would be so low it wouldn't really pass as a GP haulage truck. The other problem is what to do with the back end. The stock rear axles are way chunkier than the fronts, so going spring-under-axle would drop the back much more than the front. Also it's not technically possible without major mods as the axle won't fit between spring and chassis rail. To go spring-under-axle I'd have to notch the chassis to within a few mm of its life and reinforce what's left with solid bar. 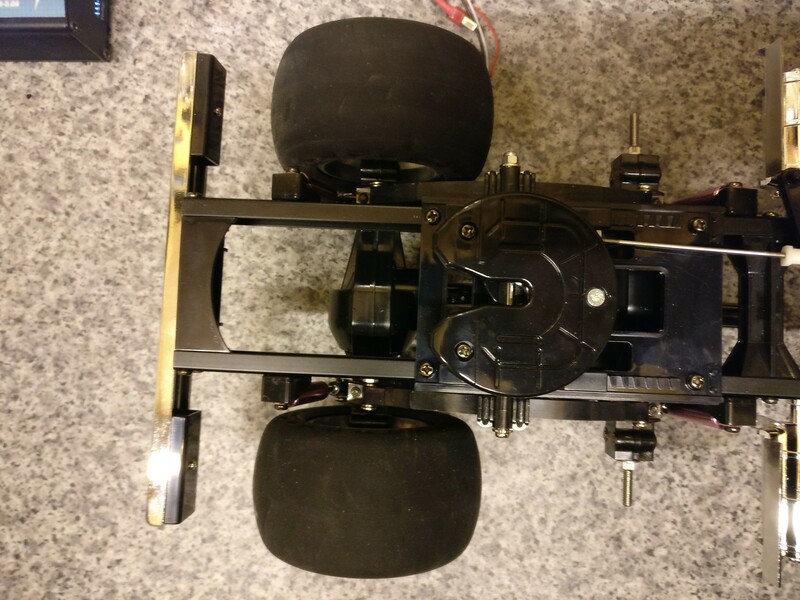 Also I'd have to fabricate some spring mounts that sit below the chassis rails to prevent the back from being too low compared to the front. 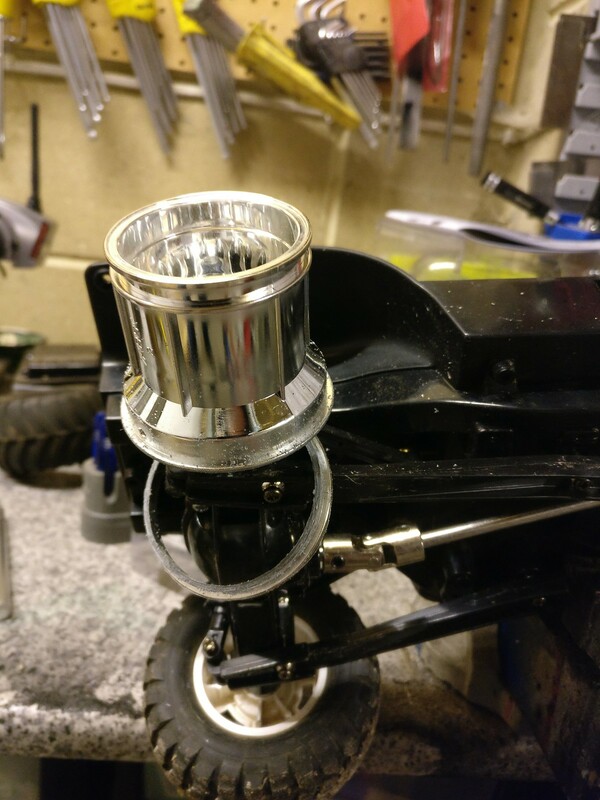 However there is another option - one that conveniently avoids and hassle with the spring mounts, the axle or even the 5th wheel being too low - cut the chassis in half and fabricate some plate to join it back together with the rear higher than the front. 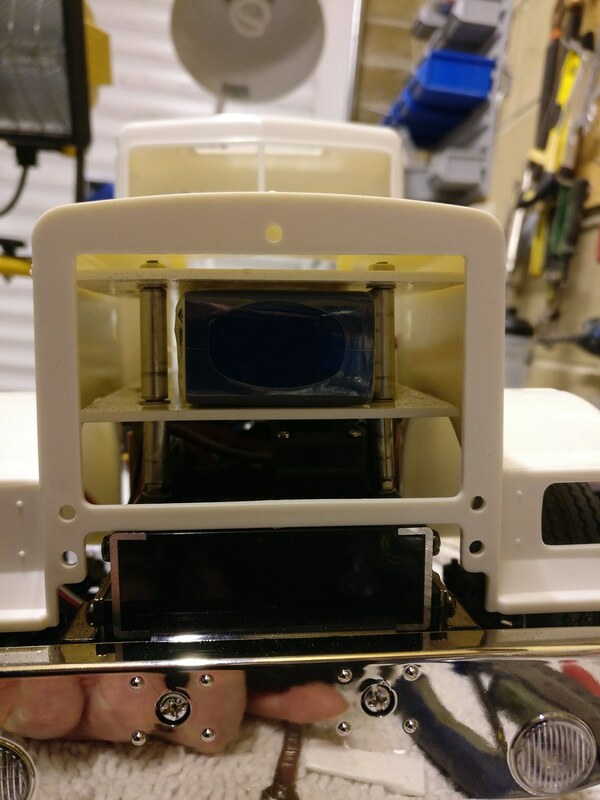 Admittedly that's a pretty drastic step - so far all I've done is drilled and tapped some new holes, and this stock Globe Liner chassis was hard enough to get hold of, I don't want to have to source another if I ruin it - but it does solve all the problems at once. 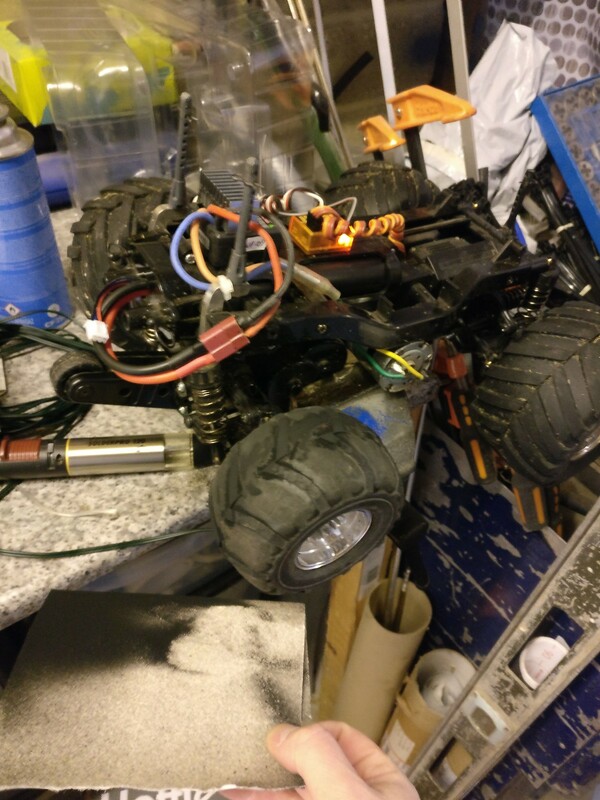 And as if to prove a point - I found myself with a spare hour waiting for some work things to finish building, so I snuck out into the workshop to do a quick bit of wrenching and see how well a spring-under-axle arrangement works. This shows the locating pin on the bottom of the stock axle, which needs removing and a divot drilling in its place to seat the axle over the spring rivet. Bottom of spring rivet shown above axle. Here's the stock recess, which normally fits over the bottom of the spring rivet. And here's the top of the rivet - this will touch the underside of the axle, hence why we need a divot. Here's the axle with the modifications made: I ground off the locating pins with a file, and added some angle to the mount area so there's no hard edge against the spring that might cause it to snap or bend. My next thought was that I'd have to drill out the axle mount plates to accept the rivet, which is bigger than the pin on the stock axle. In fact I went ahead and did this to one plate, at great cost to my fingertips, before realising that I was being a total muppet and in fact the u-bolts and plate have to be mounted upside down. The final stance isn't quite as low as I thought it would be, but you can clearly see the lean on the chassis where the front is much lower. Ride height isn't entirely easy to read in this photo due to me not being able to hold my phone, focus it and adjust the lighting balance with one hand before it moves and resets itself again, but it's basically around 10mm lower than it was, not accounting for the additional lean on the chassis rails. All in all, not as aggressive a drop as I'd expected. However, there are some problems. With the body fitted, the wheels touch the arches. Actually only just. With a stock body heigh you might get away with it (at least if you didn't want to steer). I'm going to have to look at chopping off those arches and refitting them later. It's a one-way ticket so expect me to do this with great care and trepidation. The steering link catches on the springs. I might have to flip the link or I might have to flip the hubs, or both. At the moment there's still a reasonable amount of suspension travel but that will probably go away if I'm not careful with my steering link positioning. I haven't even looked at the servo link connection yet but that's likely to be the same story. The stock shock mount can't be used as it interferes with the spring. I currently don't have shocks anyway so not a problem yet. There is no pin to locate the axle in the mount plate. However the axle seems to be secure and straight. 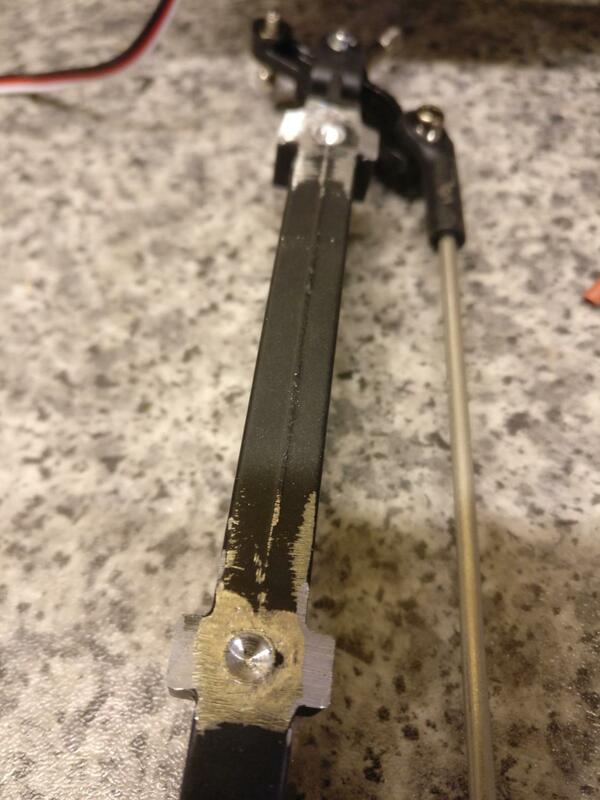 If this was doing to be a high-performance chassis then I might want to make some pins, but if it was a high-performance chassis I probably wouldn't be using Tamiya axles anyway as they're pretty poor when it comes to accuracy. 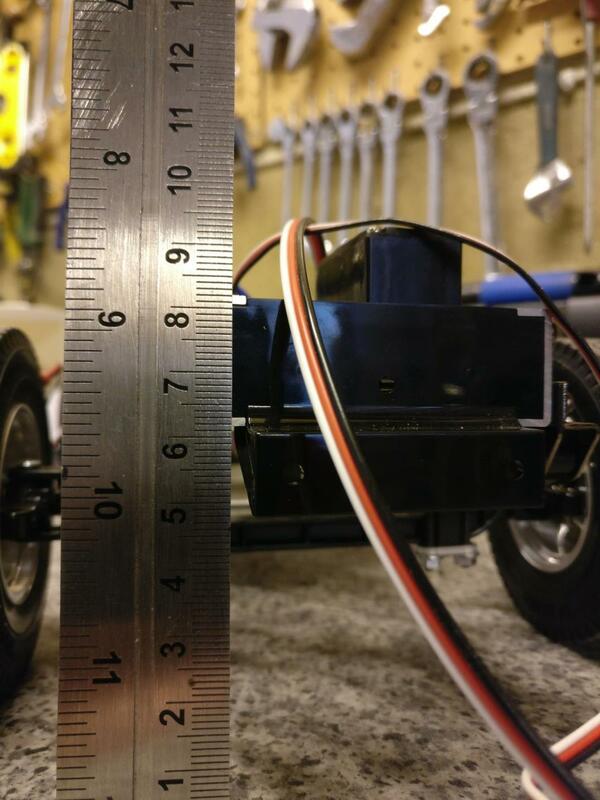 As it is, it'll drive at a walking pace around flat layouts so I very much doubt the axle will ever have location issues. 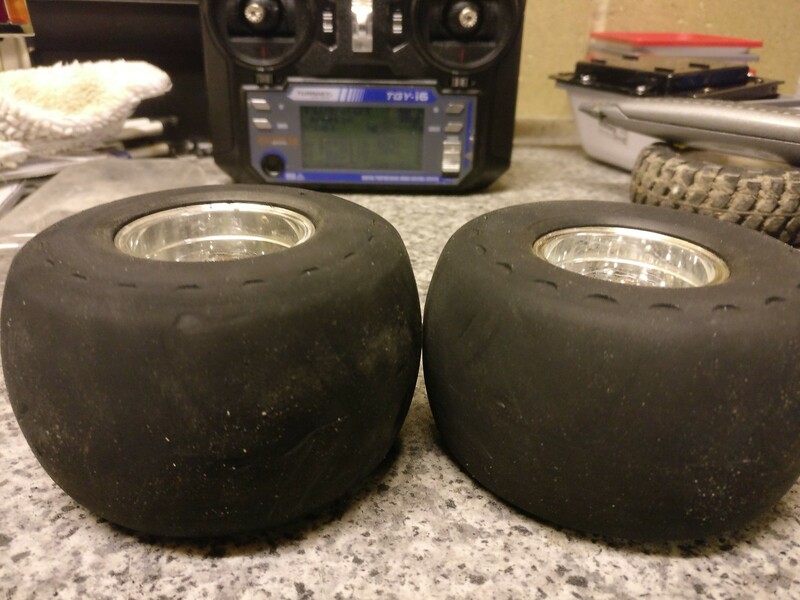 Just ordered a set of RC4WD LoRider tyres for the front. That'll drop the front end even more, and also give me the clearance I need under the arches without having to make drastic alterations to the body. 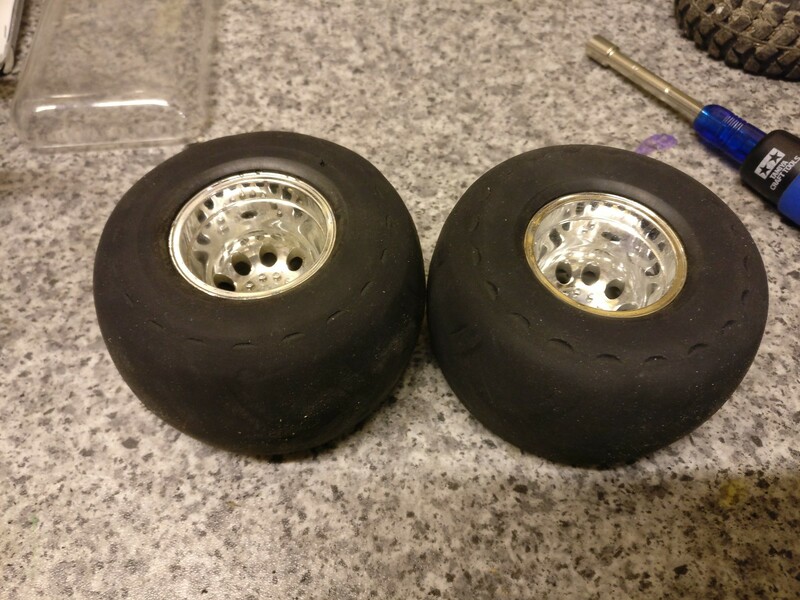 I'll keep the TLTs on the rear and if I ever run in road trim, I'll use standard Tamiya rear tyres. I've not seen a rig running low profile fronts and standard rears before, but there's a first time for everything. I can't get enough of a drop on the rear without going crazy, so I'm going to chop the chassis. I'll probably shorten it a little at the same time - it still looks a bit too long (considering it's a 4x2 now). But I'll have to wait until the tyres arrive before I do that. To cater for the tiny wheel in a big arch issue, I'll move the front axle forward a little (or the body rearward), and tub out the empty space with some swoopy flared aero panelling... Watch this space! from what i read, 4x2 is faster for these trucks.less load on the motor then two axles robbing power. watch footage of a modified dragster vs stock pro, no hopping on Funny cars or Rails. 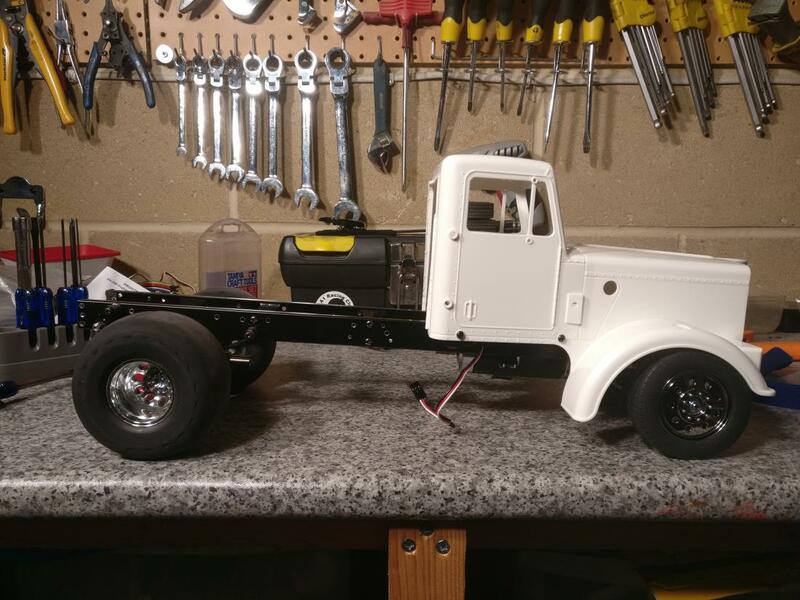 Almost all of the "proper" drag rigs that I've got photos of on my Drag Truck Pinterest board are shorter than stock - I suppose without a load on the back the weight is all over the front, so a SWB helps to put more weight over the rear tyres. They must be quite a different beast to a pro stock drag car and they're a long way from funny cars. i see, that seems pretty much rear axle and frame with wheels, wouldn't be much weight. i always like that saying " why does he climb that mountain? because he can." can you say match stick? New RC4WD LoRider tyres arrived this week, so I took the opportunity this morning to throw them on the rig and see how it looked. 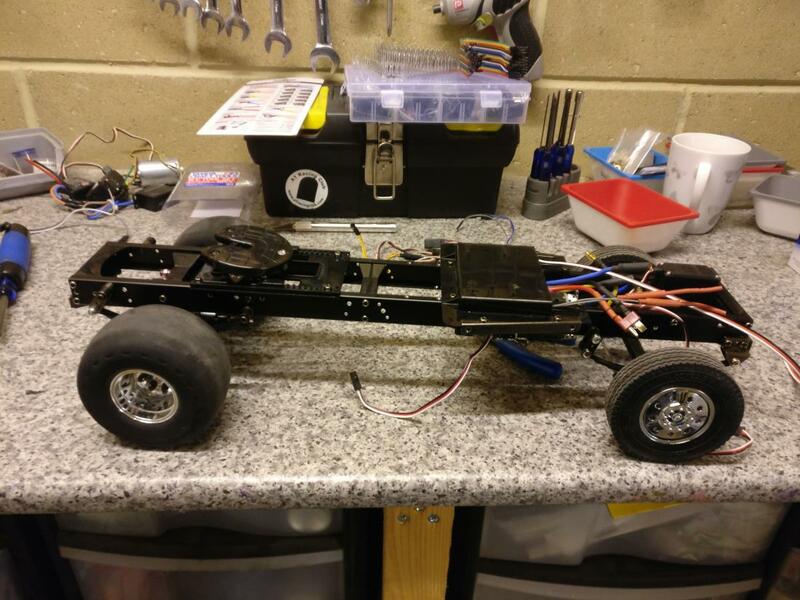 Tyres fitted - remember the axles is also in an above-spring position so the front end is now very low. I didn't want the tiny tyres to be lost inside the huge arches, so first step is to use some existing holes on the frame rails to move the entire body back a little. You can see the "stock" holes just ahead of the ones I've used. I say "stock" because these are Globe Liner rails and the holes for the King Hauler body and tanks had to be drilled. These are the mounting holes for the step boxes and fuel tanks, I believe. Final stance has that real 70s skyjacker look - I had planned to cut-and-shut the chassis to level out the frame rails but I'm actually liking this rake excessive rake, especially with the big wheels.